Millions of Americans depend on their cars every single day. Monday to Friday, you drive back and forth to work. You take the kids to school and after-school activities, and take them later. You go to the store to stock up on much-needed food, drink, and household goods. On the weekends, you go shopping or maybe to the beach. You give friends and relatives a ride. You enjoy leisurely drives with the wind in your hair and the open road ahead of you. We all have our own responsibilities and pleasures, but access to a car dictates whether you’re able to accommodate them or not. In the modern world, even with public transport and car-pooling, your own vehicle is a gateway to freedom, flexibility, and independence. Still, countless drivers take having a car for granted, and may not realize this until they find themselves without one. Buying a new car is often easier said than done, of course, especially if your credit score has dropped over time. With a poor credit score, trying to secure financing for your new vehicle can be incredibly difficult, which leads more of us to used cars instead. Considering how much of a credit-based world we live in today, there are many myths and misconceptions out there about getting an auto loan with bad credit. People having no idea whether it would be possible to secure an auto loan can be daunting enough to prevent even thinking about it, and that may result in missing out on that new car they need so much. Here are seven common misconceptions about getting a car loan with bad credit. If your score is poor, look at the myths explored below for the peace of mind and inspiration to start applying! The prospect of having to make a very large down payment on your new car is daunting, especially if you’re struggling to gather the money required. You may believe you’re expected to set thousands of dollars aside just to be considered for an auto loan, and feel your inability to do so puts you out of the running. It can be an unnecessary source of stress and frustration, on top of the challenges you already face. The reality is that you can still apply for an auto loan without having to make a huge down payment. A bad credit score may prompt some lenders to insist upon larger down payments, but this is dependent upon their own policies, the terms of the loan, and how much of a risk they consider you to be. Of course, the more money you do put down, the smaller your monthly payments will be, but you may not be pressured into a bigger down payment. Certain dealerships, especially those specializing in used cars, will be more willing than others to accept your application without a large down payment. Banks are likely to place a major emphasis on bigger down payments, especially if you have bad credit. Shop around at different dealerships and discuss what type of upfront costs you would be expected to cover if your application were successful, and you may be pleasantly surprised. Not every business follows the same rules regarding financing or payments. It’s generally believed that only people with good or excellent credit scores can walk into a car dealership and receive instant approval. This seems like a true luxury reserved for those with years of experience making every payment on time that comes their way, but you may still be given instant approval for an auto loan even if you have a low credit score. It’s important to remember that having a bad credit score doesn’t mean you’re unemployed, unable to make any payments, or generally untrustworthy. There are all kinds of reasons behind a low credit rating. For example, you may have slid further and further into financial difficulties after having your hours reduced at your job, after having to take a lower paying job after being laid off, or because of having unexpected medical or household expenses. Being unable to make timely payments is a common reason for poor credit, and anyone can get into debt, even people with high incomes. If you can show that you are currently employed and generating a steady salary, it’s more likely that a dealership will grant you instant approval. 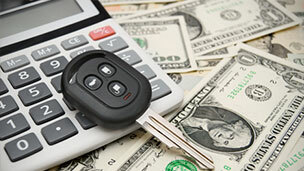 Certain businesses specializing in pre-owned vehicles are dedicated to working with customers facing bad credit scores. These companies guarantee instant approval to everyone who applies for a car loan, and base their acceptance on how likely buyers can now cover their future payments, rather than how they managed in the past. Your loan period is a vital factor to consider. After all, when you apply for financing to buy your new car, the prospect of being stuck with payments for years and years can be a challenge. It’s instinctive to want the shortest loan-term possible, to avoid paying more interest and getting the debt paid off as soon as you can. However, there are a couple of things to bear in mind here. First and foremost, your budget; agreeing to pay more than you can afford every month isn’t going to do you any favors. In fact, missing payments is more likely to cause you to fall into even more debt, potentially dragging your credit score down even further. Secondly, you need to think about how this plays into rebuilding your credit for a better rating overall. The more payments you can make on time, the better your score will continue to improve over the coming years. By spreading manageable costs across multiple plans, such as your mortgage, car loan, and credit cards, you’ll prove yourself trustworthy and reliable. A long-term auto loan might not seem too desirable right now, but people with bad credit ratings should consider this to keep your monthly expenses as balanced as possible. Don’t forget the other financial commitments you may have, or those that might pop up in the near future, when applying for an auto loan. Another common misconception about getting a car loan with bad credit is that new jobs will hamper your chances. It makes sense, of course. Starting a new job can mean your finances are a little unsteady for a month or two, as you adjust to a different income level, and there may be a chance that your new employment doesn’t work out. However, there’s no reason that having a new job and bad credit rules you out of getting a car loan. If lenders can see that you a steady work history in the past, they will be more likely to consider your application. Having years of experience in one or more positions, with minimal or no periods of unemployment, demonstrates that you’re capable of supporting yourself and meeting your financial obligations. Simply starting a new job, and having little to show for your time at a new company, is not going to undermine your work history. Some lenders will want to see at least three months’ worth of pay slips for your new job. This might not be so important if you have an extensive history of employment to point to, while others may even take an employment contract as reassurance that you will be able to manage repayments. If this is your first job, then you might find proving yourself a low-risk applicant a challenge, but certain lenders may still offer you instant approval. Building your credit score and establishing a more stable rating for the future is essential, but some believe an auto loan won’t help you do so. It turns out that auto loans are one of the best options for starting to repair your credit, even if you do have a low rating. When credit agencies are assessing your credit score, debt type is one of the areas they focus on. Car loans are generally referred to as an ‘installment loan’, which means they have rates of interest and a fixed term. This is different to credit cards, where payments are considered ‘revolving debts’, with variable rates and terms. Unlike credit cards, installment loans are come to an end after a specified number of months or years, which makes it easier for you to plan ahead. Getting a car loan with fixed monthly payments you can afford on your budget, taking possible lifestyle and work changes into account, is a smart, simple way to repair your credit rating. Manage your money so you can always make your payments when they are due, and minimize the risk of over-spending by eliminating non-essential purchases. Having a credit card or two, in addition to your car loan, can also help to show you can be trusted to pay your debts, as long as you make those payments on time. First-time car buyers, especially those of a young age, may have very little or no credit history. With no credit cards, no mortgage, no previous loans, younger people essentially have a blank slate when starting out. It’s a common misconception that someone walking into a dealership with no credit history is better than having a bad credit history to your name. It’s fair to assume that lenders would look at this, understand the situation, and be receptive to offering that person a car loan. But that is simply not the case. After all, if you have little or no history of making timely payments on a regular basis, how can lenders be sure you will manage your finances and stay up to date with your monthly car payments? They can’t be. Even if you have a bad credit score, lenders can look at the story behind your personal circumstances of financial difficulties and evaluate your current situation. If you have been dealing with a string of unfortunate circumstances, such as unexpected medical bills, or were forced to take a lower paying job, they may take this into account and still offer you a loan. Let’s say you have bad credit because you lacked the money to make payments on time, but your situation has changed. Perhaps you now have a better-paying job or fewer monthly expenses. You may have a need for two new vehicles instead of just one, or perhaps you already have a car loan but now need a pickup truck for work. You might think that people with bad credit are limited to just a single car loan, but that’s not the case. Even if you have poor credit, you might still be able to get approved, for more than one, or for a second auto loan. Of course, this might seem like taking on too much and setting yourself up for more debt than you can handle, but if the funds are available and you can demonstrate that you have a stable income, there’s no reason why you shouldn’t be able to juggle multiple payments on a regular basis. Having two auto loans you pay off each month could help you repair your credit score faster, too, as you would be showing an ability to manage multiple debts in a responsible way. Having bad credit can be frustrating and even upsetting. You may feel like it’s holding you back, or as if you have let yourself down by failing to make timely payments in the past. However, credit scores can be rebuilt and improved over time, if you choose a sensible auto loan you can afford to pay it off on a regular basis. As the above misconceptions suggest, you may not realize how good your chances of securing a loan may be, especially at Eden Autos. Eden Autos is a dealership that has a long history of getting customers with bad credit ratings, even those with no credit history, instantly approved for loans that are within their budgets. Our friendly, experienced, staff of financial professionals are always available to help you find the perfect pre-owned car or truck at a fair price, with a guarantee of instant credit approval. With our extensive inventory of quality pre-owned vehicles, we’re sure to have a vehicle to match any auto needs and budget. Call us at 215-977-4772, or stop in to see us, we’re conveniently located at 6213 E. Roosevelt Blvd in Philadelphia.